Ali Othman became responsible for the Baba Amr media center, the most active in Syria, and devoted himself to filming the military offensive and to promoting his own and his colleagues’ recordings so the world could see what was happening in Homs. And he was arrested as such on Wednesday the 28th in the city of Aleppo, where he had gone fleeing the capital of the Syrian revolt: according to his colleagues, “he is being put through the worst kinds of torture since his arrest”. “We, the members of the media center, call on all NGOs, as well as the Federation of Arab Journalists and the United Nations to act immediately and save the life of journalist and activist Ali Othman. We hold Assad’s regime fully responsible of any harm caused to him”, reads a press release from the Baba Amr information center. The biggest volcanic island in the world started its mutation towards huge laboratory in the nineties. The 103,000 square kilometers on the edge of the North Pole offered excellent conditions to experiment with wild capitalism. Iceland gradually lost interest on its fish, its sheep and its horses, and set itself onto the conquest of international markets. The “vikings” were taking the world by storm. They bought everything. They grew endlessly. And soon they could boast about owning half of Denmark, a country that had once dominated them and from whom they could not become independent until 1944. Practice seemed to confirm for a while the thesis of a new generation of Icelandic politicians, among which were David Oddson and Geir Haarde. Yes, it was possible to turn this traditional and remote territory, birthplace of the sagas, into the richest State in the world. In the United Nations rankings, Iceland ousted Norway as the best place to live in the world. “Flat-screen TV’s and Range Rovers became the symbols of the pre-crash era”, Silja Bára Ómarsdóttir, political scientist from the University of Reykjavik, explains. In the “post-crash” era, Iceland gets a taste of getting out of the crisis. Activity continues in the biggest volcanic laboratory on Earth. What happens when wild capitalism fails? Can a currency recover after having lost almost 70 percent of its value in just one year? How does a society that didn’t know employment shortage face a 10 percent unemployment rate? And the key question: How long does it take to get into shape a State in debt for 200 percent of its GDP. “God save Iceland”. Little more is remembered about the speech Geir Haarde, then prime minister, pronounced on October 6th 2008. There’s no need either. The phrase is an accurate sum up¿?. In their frenetic expansion, the country’s three biggest banks had not been too careful. When the international economy entered recession, the house of cards built by the insatiable vikings fell apart. The government had to step in. And the country on the limits of the North Pole ended up doing a balancing act on the verge of bankruptcy. But a viking doesn’t give up so easily. “It might sound like a nationalist cliché, but we are a people that if we fall, we get back up. Maybe that mentality is a consequence of the climate we live in. Or of the fishing culture: if you haven’t fished today, you go out again tomorrow”, Bára Ómarsdóttir explains. Fish are interesting again in Iceland. And sheep and horses. Since the collective impact of October 6th, the island is going back to its roots. “Now more local produce is being consumed. Traveling inside the country has gotten back the popularity lost during the boom, when Icelanders vacationed abroad several times a year. Before people remodeled their homes completely like it was nothing, today people recycle and reuse more and second hand clothes are being worn again”, the Icelander describes. “We are living a time of big changes in Iceland”, Bára Ómarsdóttir comments, and she is not only referring to the fact that people now mend the socks they used to throw away. What has been set in motion in the island is a true revolution: the “cooking pot revolution”, they call it, because armed with them the citizens went out to make noise in front of the Reykjavik parliament until in January 2009 Haarde’s government fell. Protests like these had not been seen in 60 years, when the country became a founding member of NATO against the population’s will. The prime minister’s resignation –sick of cancer- and the punishment of his Independence Party in the later advanced elections were not enough, however, to appease the anger of the Icelanders. David Oddson, Haarde’s predecessor who went from head of the Executive to head of the World Bank with the correspondent and ignored conflict of interests, had to leave his office. In April 2010, a Parliamentary Investigation arrived to the conclusion that both of them, like other high-ranking officials, had favored with their negligence the financial collapse. Haarde will have to take responsibility in a court of law. Iceland is trying to start over. Get back the values that got away through the gates opened by money. Rearrange the priorities: in daily life and also in politics. Now the Icelanders don’t only remember their fish, but also that their Althing is one of the oldest parliaments in the world. In this Assembly got together the goði, the chiefs of the clans previous to the introduction of Christianity, since 930. Always in absolute equality. “The principle that we are of equal is part of our national identity. No one, regardless of their position, has a right to usurp power”, Bára Ómarsdóttir asserts. 1,200 island citizens were chosen at random in 2009 to take part in a “national encounter” along with organizations, pressure groups and politicians and debate -all of them on an equal level- over the options for the country’s future. Now, 25 common citizens -and no politicians- try to include in the Constitution the proposals made in that meeting. Silja Bára Ómarsdóttir sits in the new constituent assembly. “Of course it is an honor to have been selected”, she admits. The only requirements: being over 18 and having more than 30 support signatures. “We are still not too sure about that changes we are going to make in the Constitution: if we are going to rewrite all of it or if we are going to modify some parts. We have just started working and we are still familiarizing ourselves with the national encounter ideas”, the political scientist tells. “The truth is, the task of reforming the Constitution was due since our independence in 1944. Now a series of factors have converged and made it possible and I hope that, at the end of the process, we will have been able to give more room to subjects such as the fact that the power emanates from the nation, the humanist values and the environmental subjects”. With a population of 320,000 people, in Iceland last names are almost unnecessary. But size is not relevant when it comes to set into motion a participatory democracy, Bára Ómarsdóttir thinks: “any country can choose a group of people to draw up a Constitution. Here there were also people against doing things this way, but in the end they could not impose themselves, and I’m glad”. Size doesn’t seem to be crucial either on another battlefront: the Icelanders refuse in an impertinent way to be the ones to pay for the debt their banks had with British and Dutch clients, and that the broke entities cannot pay back anymore. London and The Hague temporarily assumed their citizens’ compensation, and now they demand from Reykjavik 3,800 million Euros. An agreement between the three countries -approved by the Icelandic government and Parliament- planned the refund of the money in a 15 year period at a 5.55% interest rate. But the President of the Republic imposed his veto, and the Icelanders voted “no” in a referendum twice, the last one on April 10th. The payment would increase even more the Icelandic debt and it would call back to the ghost of bankruptcy. But it’s not refunding the money what sparks off popular opposition, it’s the terms of the agreement. Meanwhile there are rumors that an improved version of the document could go around, but already from the first rejection at the polls the system fell upon Iceland with all its force: the international loans granted to the country as support for the economic crisis were suspended, the application to join the European Union called into question. Joining the EU does not worry Icelanders too much. During the past Spanish presidency it became clear that the conflict with Great Britain and the Netherlands goes on away from the access contacts. And, anyway, the idea of belonging to the Community club and having to abide by its fishing norms is hardly attractive in these latitudes. It could be more dangerous if the combative citizens had to learn that the market’s forces are too powerful for a single volcanic island, even if it is the biggest one in the world. In the end, directly or indirectly, they are going to end up paying for their banks’ extremely expensive broken china, believes Bára Ómarsdóttir. “That is why I would have preferred a negotiated solution from the beginning”, she says. But, what kind of avenging and poised Vikings would those have been? Protest in Tahrir on May 1st. Kamal Khalil, Socialist leader of the Workers' Party (Hossam El Hamalawy). Dozens of thousands of Egyptian workers gathered this Sunday in Cairo’s Tahrir Square to celebrate May 1st, for the first time in freedom and with independent unions. Some of the most heard chants were directed against the policies of the International Monetary Fund or the World Bank and in favor of Social Justice and workers’ rights. There was also criticism for the only union federation that existed during the regime, whose leader, Hussein Megawer, is being investigated for corruption. “The time of the Egyptian workers has come. It is our moment, we have to make the most of it to achieve a country with social justice”, as socialist leader Kamel Kahlil pointed out, who officially announced the launching of the Workers’ Party. During the act a statement signed by 29 organizations was presented, among them, the Young Revolutionaries Commission, several left-wing groups, independent unions and Human Rights organizations. The workers’ fight in Egypt has been key to the revolution and still has an undeniable leading role. Every week there are strikes to demand labor rights and decent salaries in a country in which 40% of the population lives under the poverty threshold, in which there is no public health attention and in which workers get paid around $70 a month for working at least eight hours a day, six days a week. There are already dozens of petitions that workers have brought to the courts demanding the nationalization of factories and companies who used to be public, sold years ago to foreign corporations during what became known as the Egyptian economic reform, promoted by the IMF and the World Bank. With said reform hundreds of companies were sold often at prices lower than their real cost. Their new owners, instead of investing in them, have often used them to speculate with the sale of their terrains. One of the cases that is creating a lot of buzz in the Egyptian press is the one of the historic chain of clothing Omar Effendi, in its day an icon of the Egyptian service sector. Last February the coordinator of the “Don’t sell Egypt” movement, Yahia Hussein Abdel-Hadi, brought charges against the former Investment minister and the director of the General Holdings company for having made the State lose money on purpose with the sale of Effendi to the Saudi company Anwal “for a sale 700 million Egyptian pounds lower than its estimated value”. Shortly after Hamid El Fakharani, the lawyer who represents the workers, filed a lawsuit in which he maintains that Effendi was sold for a quarter of its real value and that is why he defends that said transaction was not valid. A courthouse is due to rule on May 7th whether Effendi goes back to being public property. Another one of the cases that are being talked about the most is the Shebeen El Kom textile factory, located about 80 km from Cairo. In 2007 the State sold it for below its real price to an Indonesian corporation that works for well-known brands such as Nike and Adidas. The staff went from having 5,800 workers to being reduced -gradually- to 1,200 in staff and 600 more without a yearly contract. Last February 5th, three days before the fall of Mubarak, many of the countries factories stopped. Those strikes were decisive for the dictator’s exit. The Shebeen El Kom workers joined the strike for days. On March 5th they resumed it and since then they keep it up. They’ve been on strike for a month and a half. “We ask that the company be nationalized, we have already filed a complaint to the courthouse. We also demand a minimum wage of 1,200 pounds”, explains to Human Journalism Mohamed El Nagar, one of the oldest workers, who in spite of 38 years as an employee, only earns 1,100 pounds a month, including expenses. “As soon as the factory was sold they started to fire us. They were supposed to be buying it to reorganize, invest in it, to fix it, but instead they started to take it apart. They bought it to eliminate the competition”, complains Mohamed Awad, a 33 year old worker. Taking a look at the facilities one notices a great degree of neglect. Several premises are already empty, in others there’s no more activity than that of the spiders weaving their webs over abandoned machines. In one of the compounds pieces of scrap pile up. A sign at the entrance of a waste ground, former cotton warehouse, announces that it has been rented out to another company. Several employees insisted on showing this journalist the state of the bathrooms, broken down and without the least health or hygiene conditions. “Since the company was sold security measures are not kept either. We don’t have headphones to soothe the noise from the machines, nor glasses to protect us from the dust from the fabrics, nor face masks, despite working with materials that harm the respiratory tract”, explains the veteran El Nagar. The workers at Shebeen El Kom have joined forces in a new independent union and have gotten the support of other factories in the country, like the already historical textile factory in Mahalla, where in 2006 3,000 female workers kicked off a series of strikes that have multiplied themselves since then and that marked the prologue of the Egyptian revolution. “If us workers stand together, we will win”, Kamal El-Fayoumi, union lider of Mahalla, tells Human Journalism. Some counterrevolutionaries are accusing us of stopping the country, of ruining it. No, they’re wrong. Workers never stop a country; the build it. Several of the movements that encouraged the revolution are in contact with the workers. It’s the case of the April 6th Movement and the Young People for Justice and Freedom. “The workers supported the young people in the first stage of the revolution and now the young people of the revolution support the workers”, indicates Naguib Kamel, a member of the latter. Sheima Hamdi, only 23 years old, is another one of the members of this young people’s movement. Several uploads on Youtube of her public interventions have made her known throughout the country. The strength of her speech has been enough to earn her the nickname on the Net of “the strongest woman in Egypt”. “The Shebeen El Kom case represents the cause of all of Egypt’s workers. That’s why we are following it and supporting it so closely”, she points out. 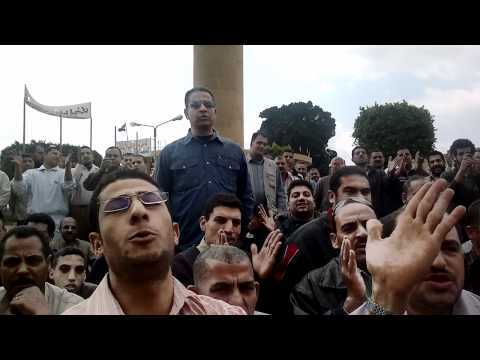 Last April 5th hundreds of Shebeen El Kom workers protested at the government headquarters to demand negotiating directly with the owners. Seeing the presence of several local and foreign media outlets, regional authorities were forced to act as spontaneous spokespersons for the workers, with the help of the already experienced Mahalla union leaders. The managers ended up offering more expenses, longer contracts and the readmission of half of the workers who were laid off without a severance pay. The workers were pleased, but they felt that the offer is not enough. Keeping that stance is not easy. They haven’t gotten their wages in the last two months and it is starting to take a toll. The resistance strongbox doesn’t go too far. But apart from some exceptions, the whole staff of the factory has made up its mind: To hold on together. Now they wait for the court’s verdict, that this month of May, if the date is not postponed, will have to decide on the petition to nationalize Shebeen El Kom. The levels of inequality and poverty in Egypt have reached unbearable levels because of the neoliberal and corrupt policies of the regime. The discredit on the chronic capitalism practiced in the last few years is not only present in the minds of the Socialists, but also in moderate Democratic sectors fed up with the unstoppable enrichment of a corrupt and repressing elite opposite to the impoverishment to the majority of the population. The left-wing knows this, which is why it is hurrying to set up solid networks and to promote initiatives with a clear objective: to achieve a new economic and political system more fair, more equal and more balanced. After Bashar Asad’s reactionary speech in which he avoided talking about reforms, the protest campaigns become consolidated through Internet. The regime’s promises of not shooting at demonstrators haven’t stopped the repression. There are countries in which free access to the Internet is not a right. It is rather a tool feared by regimes, which they try to block, restrict or limit, in a vain attempt to keep Internet surfers to see beyond the limitations. It happened in Sadam Husein’s Iraq, in Ben Ali ´s Tunisia and in Hosni Mubarak’s Egypt, it happens in Iran, in Libya, in Bahrain, in Saudi Arabia, in the United Arab Emirates, in almost all of the Arabic world- with the exceptions of Lebanon and Palestine-. And, of course, in Bashar Asad’s Syria. Last weekend, Syrian web access suffered a blackout for six hours. It wasn’t the first time since the Arab spring began, but it is very meaningful. In the context of revolutions, the mix of hopelessness, education, a fit of dignity and communication skills, every blackout seems to show the desperation of a regime which sees itself against the ropes. So it isn’t a good sign for Damascus that Syrian internet users, who are used to dealing with all kind of difficulties, were disconnected last Sunday. Useless, on the other hand: in social networks like Twitter or Facebook there are all kinds of open manuals and software made to get around the regime’s obstacles, to prevent IP addresses from being detected and even to stay online when the Internet has been disconnected. Everything is useless. In Syria, where many web sites- media considered hostile, sites seen as revolutionary- are blocked by the regime but there are a lot of Internet Cafes whose owners, well versed in computers, can solve the access difficulties in a couple of clicks. That´s why it was surprising that the first calls to demonstration, which were announced through Facebook, didn’t work. Dozens of muhabarat agents showed up at the protests, willing to break up marches that nobody attended. It was explained that these first calls came from outside of Syria in an external attempt to mobilize the dissidence. The regime became over-confident and even unblocked access to Facebook for the first time in History- until then, Internet surfers overcame with wit and tunnels the block on the social network, imposed as soon as it became popular- and that’s where it all started, Ahed al Hendi, Syirian dissident responsible for the Arabian section in Cyberdissidents.org, platform dedicated to giving an online voice to dissidents around the world, explains to Human Journalism. “Without the Internet, we wouldn’t have been able to see videos or pictures of the crimes of Asad’s regime. The Internet activated the first movement when members of anti-Asad groups marched along Damasco on March 15th. When the media showed the videos of the protests that were posted on line, many more Syrians watched it, and it helped to break the wall of fear” Hendi remembers through an email exchange. Adel left Syria four years ago, after being released from prison: he tells that for 40 days he was incarcerated because of his involvement in pro-democratic activities, being an student. Nowadays, he is an active regime opponent who uses any forum to call for insurrection, as he recently did in a Wall Street Journal article, where he analyzed the role of the Internet in the protests. “The first calls to protest started on Facebook”, he wrote. Organizers have preferred to stay anonymous, but one thing is clear: they aren’t Islamic. In the group Syrian Revolution against Bashar Asad, with 60000 member so far, Fadi Edlbi has written “national unity, everyone for freedom, Christian and Muslim”. Another member, Shadi Deeb, “ we are not Sunnis, we are not Alaouites , all of us sing for freedom”. And while he is saying this, he puts a picture with the cross and half moon as a sign of unity. The page in question has today 104.000 fans. It seems ironic that it was Bashar Asad who introduced the Internet into Syrian houses when he came to power, 11 years ago. He promised to generalize its use, but the figures speak for themselves: of a 23 million people population, there were just 3.935.000 users in June of 2010, 17’7 % of the population. And until last February, it was officially forbidden to access Facebook. However, this hasn’t prevented that, from outside and inside the country, Syrian have used social networks as an instrument of mobilization. Or rather, that the facts spread on social networks, overcoming state censorship,are mobilizing consciences. What would have happened if the Internet had existed in 1982, when Hafez Asad, father of the current president of Syria -actually, Bashar inhereted the office- ordered the massacre of between 10,000 and 20,000 civilians in Hama to suffocate an islamist revolt? “The truth is that without social networks, we would have never known about what happened two weeks ago in Daraa: it would have been exaclty the same as with the Hama massacre”, explains #daraanow, an active twitter. The person hiding behind this user calls himself Fash (something like annoyance in slang), was born and raised in the city of Daraa, the same one that originated the protests after the arrests of 15 students by Syrian agents: they were accused of painting a revolutionary slogan on a wall. “Now, thanks to Twitter, Facebook and the uploaded videos it took me less than five minutes to know the story of those kids. I don’t even want to imagine what would have happened if we had had them 30 years ago. A lot of people still have no idea about what happened in Hama”. So understandable has been the eagerness to tell what was happening as the eagerness to know. “I had more than 200 followers (on Twitter) in the first hour, I imagine because people had a lot of curiosity for what was happening in Syria, a country in which no one has been able to stick their nose in in the last 30 years”. And the more followers he has (more than 1,200 right now), the more he wants to carry on with what he has called e-jihad, a cybernetic and secular war with the only goal of taking down the dictatorship and obtaining freedom. “There are many more people promoting initiatives like mine inside the country at a larger scale”. Because the difficulties imposed by the regime are relative. “There are many ways to avoid censorship, such as proxy servers that work from the outside of Syria”, continues Ahed. “The people of Syria are beginning to understand the crucial role the internet and social networks play. In spite of the fact that the government does everything in its hand to stop being connected to the world, the examples of Tunisia and Egypt prove that this instrument has been underestimated. The Syrian regime still has the idea of the Hama massacres: Kill and no one will know. That is over, the Syrians know it”. For those who don’t have computer knowledge or a computer with which to tell the outside world about what is happening, there are cell phones. Almost half the population owns a cellular phone and recordings and pictures taken with them fly, as prove several Facebook groups such as the Syrian Uprising Information Centre, brother to its arabian site, which live off the civilian contributions to illustrate what is happening in Syria. Basically Twitter is used more to spread information to the world than to mobilize people”, stresses Hendi. “It’s Facebook what is mobilizing the people. And I fear that if this hadn’t started in Tunisia, it would have in any other place. Tyrannies cannot last forever”, concludes the ciberactivist.